Restaurant: Chef David Toutain’s namesake restaurant is located in the Seventh Arrondissement and was named “One of the most exciting restaurants in Paris,” by Alexander Lobrano, award winning food writer. Creative, friendly, and open, restaurant David Toutain is full of light and is decorated in natural materials of oak, concrete, and glass. Vegetables are at the forefront of Toutain’s daily changing menu. Chef: A native of Flers, Normandy, David Toutain is the grandson of farmers. David, inspired by summers of eating fresh picked vegetables from his grandparent’s garden, naturally gravitated towards cooking. As a young man, David got a job at Arpége, Alain Passard’s restaurant in St.-Germain-des-Prés. Within a year he was Alain Passard’s under head chef. At Arpége, David spent three years experimenting with vegetable cooking. 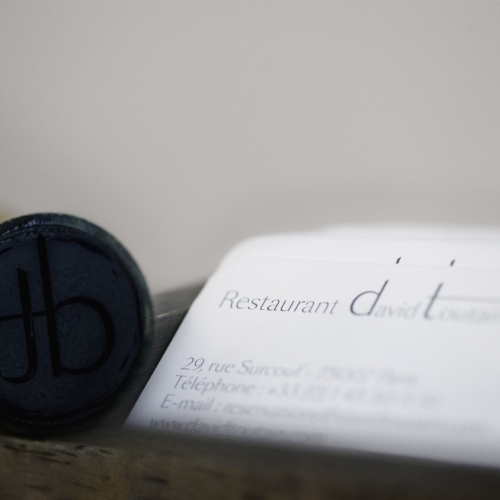 David continued to work under many culinary heavyweights including Bernard Loiseau and Marc Veryrat. David describes his time with Chef Veyrat as an "amazing experience," as he learned to taste and cook mountain plants, herbs, and flowers. After stints at Mugaritz (Spain) and Corton (New York), Chef Toutain returned to France and joined the restaurant Agapé Substance. Part of the restaurant’s great success was due to the starring role that vegetables played. In 2013, Chef Toutain spent a year traveling the world and returned in 2014 to open his eponymous restaurant. Butter: David Toutain serves traditional raw butter which he says reminds him of the butter he ate on his grandparent’s farm in rural Normandy. Chef Toutain wants the presentation to be handmade and raw, like the product. “I like things natural, with their imperfections,” he adds. Waiters bring to the table a ball of butter served with a roll sitting on hay.